This post was originally published over on the New Left Project blog. On the 1st September the act of squatting in a residential building became a criminal offence under Section 144 of the Legal Aid, Sentencing and Punishment of Offenders Act (LASPO). This unprecedented piece of legislation was enacted to a flurry of government statements claiming ‘justice’ and ‘protection’ for “hard-working homeowners” against the “misery of squatting”. At once both mimicking and feeding vitriolic media campaigns, Justice Minister Crispin Blunt claimed that “by making this change, we can slam shut the door on squatters once and for all”. By Monday the 3rd September we saw police with battering rams in Brighton enforcing the law for the first time: forcibly evicting and arresting three people for the new crime of squatting. 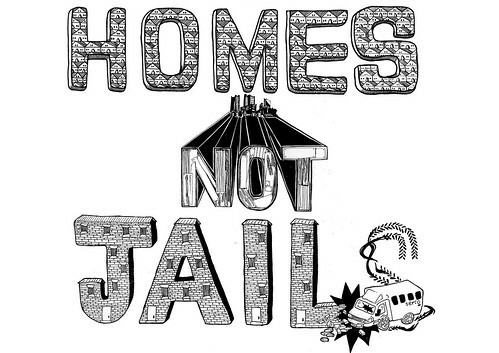 Since then the Squatters Legal Network (SLN) and Squatter’s Action for Secure Homes (SQUASH) have received news of 14 such arrests, whilst countless ‘known unknowns’ slip under the radar. The end result of a bankrupt parliamentary process and a biased media campaign, the criminalisation of squatting in residential properties epitomises the Coalition government’s privileging of private property rights over the needs of some of the most vulnerable in society. This myth-peddling collided with the Coalition’s tendency to dismiss the mechanisms of representative democracy to create a thoroughly bankrupt parliamentary process. The government introduced the clause to criminalise squatting into the LASPO bill just three days before its final reading in the House of Commons, leaving no time for parliamentary scrutiny. This followed a consultation in which 96 percent of respondents were opposed to such action. All hearings in the House of Lords happened after 11pm at night. Up to 50,000 people were criminalised in a matter of months. Once again, rather than acting on their professed commitment to a small state, the Coalition has enlarged the repressive arm of the state to protect private property rights. Acting under cover of protecting ‘homeowners’, the government have bolstered state sanction of one of the most anti-social manifestations of property rights – the ‘right’ to keep properties empty. Such is the Coalition’s dedication to privatisation that they are extending it to empty space and abandoned buildings. This is no small phenomenon: there are 930,000 empty properties in the UK. And their owners, most of whom do not intend to use these properties as their own housing but as a profitable investment, now possess what amounts to a state subsidy to ensure their buildings remain unused. By criminalising those using empty properties as shelter in times of need, the new law allows property owners to rely on the police to evict squatters, rather than bearing the costs themselves. Indeed, SQUASH’s research shows that the costs to the taxpayer of criminalising squatting could reach up to £790 million over the next five years, (including an increased housing benefit bill, policing and criminal justice system costs), wiping out expected savings made by all other aspects of the LASPO bill. To extend this protection, the state has placed squatting directly under the police’s remit. By transferring squatting from civil to criminal law, the government have removed pre-emptive judicial scrutiny from the eviction process, empowering the police to make complex legal judgements beyond their capacity on the doorstep. This further exposes vulnerable tenants, people with license from owners to occupy a property, and those squatting in commercial rather than residential properties, to the risks of illegal eviction. Not to mention enhancing the toolkit of repressive legislation at the disposal of police targeting political activists, such as the pre-emptive raids during the royal wedding. So who is affected by this change? Outside of government rhetoric, it is difficult to identify ‘squatters’ as a uniform (anti-)social group abstracted from the context of economic crisis. Research undertaken by homelessness charity Crisis found that 40 percent of single homeless people have relied on squatting as an alternative to street sleeping. This is not surprising once one undertakes even a cursory examination of the present housing crisis: private rental costs spiralling ever upwards, five million people already on social housing waiting lists, a 14 percent rise in official homelessness rates in the last year, and homelessness provision diminishing with each cut to local authorities and homelessness charities. Squatting is not simply a ‘lifestyle choice’, or an issue of squatters’ ‘personal morality’. As Crisis reported in September 2011: “The evidence suggests that the majority of squatters were sleeping rough immediately prior to squatting. Squatting, then, typically reflects a lack of other options, a scarcity of provision, and inadequate support and assistance to single homeless people.” Criminalising squatting is, therefore, nothing short of criminalising homelessness. For example, the 14 people arrested under the new law so far include 5 young people, one aged 16, arrested for squatting a residential property in Somerset. These teenagers turned to squatting following the refusal of planning permission for a new YMCA providing beds for homeless youth in their town. Local residents had complained the YMCA would bring ‘anti-social behaviour’. In the early stages of this new law being enacted, these arrests represent exactly how blame is displaced onto the young homeless and away from the governments and communities who have abandoned them. The government has criminalised these young people for attempting to house themselves in an abandoned building, whilst at the same time systematically dismantling the welfare and other safety nets, for example housing benefit for the under-25s, which might prevent them from living on the streets. The criminalisation of squatting in residential properties thus sits neatly within the Coalition’s broader attack on the survival mechanisms which attempt to guarantee some standard of living in a society shaped by rapidly narrowing access to the private accumulation of wealth. This survival mechanism extends to those engaging in directly political activity, in arts and culture, in social work. Squatting provides a low-cost way to house oneself whilst undertaking non-profit making, and thus often not remunerated, activities fundamentally important for the rest of society. This is especially the case now, when economic crisis and youth unemployment has rendered those in their 20s the ‘lost generation’. Liberation from rent can open the way for liberation from having to sell one’s labour to capital – reclaiming control over one’s time and the ability to deploy it for good. Furthermore, trespass and occupation – the seizing of both physical and discursive space – are foundational tactics within political action. 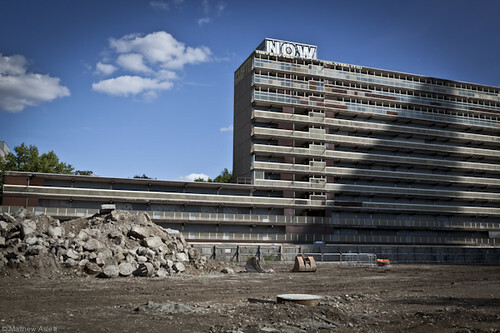 In occupying an empty building, overtly politicised squatters are often taking decisive action to oppose an unwanted development: from the demolition of council housing to the building of luxury accommodation that prices out a local community. The criminalisation of squatting in residential buildings thus threatens those undertaking political resistance in both these senses: as a means of taking action and as a means of reproducing our lives. Further to this, squatting as an abstract idea contributes something incredibly important to wider society. Squatting keeps alive the idea that space and property is not simply the reserve of the wealthy, but preconditions of a dignified human life which we all deserve access to. When squatters occupy, look after and improve dilapidated properties in their local community they challenge the ideology that market forces will best direct the use of resources for the good of all. Squatting reveals that all too often, we are better are doing it ourselves. With criminalisation, the government have undertaken an ideological attempt to silence this contribution. Owen from the Squatter’s Legal Network argues that resistance to the new law is playing itself out in multiple arenas: “There will be resistance through the courts, and we are organising to ensure that those evicted and arrested have good legal defences. But squatters aren’t going to take this lying down. We foresee that there will be an increase in people resisting eviction or defending themselves from raids by the police because for many their only choice is defending their homes or ending up on the streets.” Indeed, when most of those who squat are without an alternative but to continue squatting, and when the UK has almost 1 million empty properties, this is not the ‘end of squatting’. This is not merely because squatting in commercial properties is not yet a criminal offence. Far from having ‘slammed shut the door on squatting’, the government have opened up the potential for a resistance which will play itself out on the doorsteps of squatted properties up and down the country. Whilst the right to keep properties empty has been asserted as legislation, and as the eviction wave begins, we will see how far it becomes a reality on the streets. Hannah Wilcox is a member of SQUASH and Squatter’s Legal Network.